Reliable and safe operation are essential requirements in the branches covered by our activities. Our service experts check and regularly monitor process engineering machinery and apparatus as to its operability and safety. Critical components are replaced in coordination with you before suffering wear. Thus unscheduled downtimes with high consequential costs are avoided. 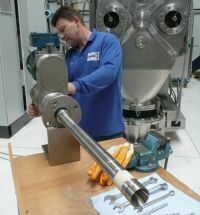 Heinkel Group specialists will regularly perform the mandatory safety checks and risk analyses. These serve to comply with the accident prevention regulations and also serve to comply with your high quality requirements. Our specially trained fitters and service technicians (certified in accordance with SCC) are available to you also at short notice. By means of a precisely planned approach they process even highly complex units within a tight schedule at economic conditions. So that your system can be recommissioned and operate safely and reliably over a long time. 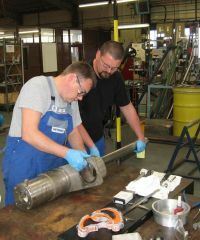 On-site and also in the factory we repair your machines and your process equipment using original spare parts. After initial testing and cost assessment we will run the repair promptly. Our trained and experienced service technicians will at short notice perform the desired repair using original spare parts and in coordination with you on site. Here you as our customer may rely on the same professional implementation of the repair work with the same high quality requirements as for in-house repairs. 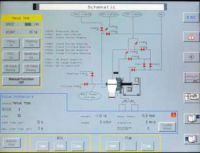 As far as possible on-site, test and commissioning logs are created. Through our teleservice we can link ourselves to your system also by way of electronic data communications. When requested and after having received your approval we can log into your system for joint troubleshooting. 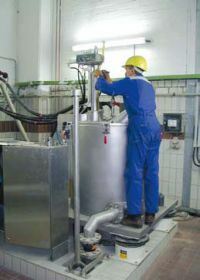 Faulty machinery conditions can be detected more easily, and frequently remedied more quickly. Here we support your operators with specific instructions for effectively resolving the problems thereby allowing you to rapidly resume production. However, should the presence of a service specialist be required, then the downtimes and repair costs can be significantly reduced through well-run preparations.